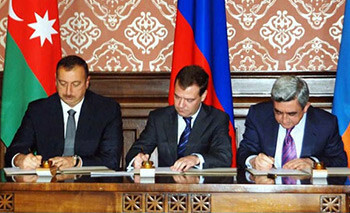 Russian president Dmitry Medvedev (center) signs a declaration with president of Azerbaijan Ilkham Aliyev (L) and Armenian president Serzh Sargsyan following their talks on a Nagorno-Karabakh settlement, Mayendorf castle outside Moscow, November 2, 2008. The Moscow declaration states that any agreement must include "legally binding international guarantees." The key obstacles to settlement are Armenian distaste for Azeri rule, Azeri dislike of Karabakhi independence, and an inability on either side to commit themselves to sustaining difficult concessions over time. There is, therefore, a need for a third party to intervene, but it is hard to find anyone to play this role. The Goble Plan, first advanced in 1992, proposed that Azerbaijan surrender its claim to most of Nagorno-Karabakh in exchange for Armenian withdrawal from all other occupied territories and the establishment of an internationally monitored travel corridor between Nakchivan and the rest of Azerbaijan. This has so far proved unworkable. A full settlement may only be achievable if one side concedes status (i.e., control of Nagorno-Karabakh) unilaterally, but this is unlikely to happen. However, smaller-scale agreements, such as an exchange of Armenian withdrawal for removal of sanctions by Azerbaijan, could make both sides better off and reduce the likelihood of another war. Nagorno-Karabakh was a predominantly Armenian region within the Azerbaijan Soviet Socialist Republic (SSR). At the end of the Soviet era, the region tried to leave the Azerbaijan SSR and join the Armenian SSR, and in 1988 intercommunal violence broke out. As the Soviet Union collapsed, the conflict expanded into an interstate war between the new states of Armenia and Azerbaijan. The war was complex and dirty, pitting neighbor against neighbor and featuring informal militias as well as two national armies and remnants of the Soviet military. Fighting ended in 1994 with Armenian and Karabakhi forces in control of most of Nagorno-Karabakh and substantial swaths of Azerbaijani territory outside the contested region. More than seventeen thousand people died in the fighting, and more than one million were displaced. During the fighting, Nagorno-Karabakh was effectively ethnically cleansed—forty thousand Azeris lived in the region prior to the conflict and almost none remain. In addition to controlling 95 percent of Nagorno-Karabakh, Armenian forces also occupy a buffer strip of territory around Karabakh that constitutes 13 percent of the territory of Azerbaijan. The initial ambition of the Karabakh Armenians was to merge their territory with Armenia, but following the fall of the Soviet Union, this became politically untenable. Nagorno-Karabakh declared its independence in 1991, and Armenia finally lent its official support to this goal in 1998. The persistence of unrecognized statehood in Nagorno-Karabakh is puzzling, as it is elsewhere, because unrecognized statehood is inefficient. Enormous inflows of capital from the Armenian diaspora have succeeded in propping up the Karabakh economy, but the costs of non-settlement remain high. Rail links between Azerbaijan and Armenia have been closed since 1989. Turkey closed all land connections with Armenia in 1993, and Azerbaijan has continued its efforts to isolate Armenia and Karabakh economically. Estimates of the total cost to Armenia of the blockade range from 10 percent to 30 percent of Armenia's gross domestic product (GDP). The constant threat of renewed violence has hampered the rebuilding of private enterprise in Karabakh, and the region remains dependent on economic support from the Armenian diaspora. Two thirds of the region's population has been displaced. A 2005 Crisis Group report estimates that roughly 70,000 ethnic Armenians from Nagorno-Karabakh are currently living in third countries (in addition to 40,000 displaced Azeris, mostly now in other parts of Azerbaijan). Azerbaijan too bears costs of non-settlement though not such high ones. The risk of a recurrence of hostilities hinders foreign investment, particularly in non-energy sectors, and the costs of military mobilization have diverted spending away from other domestic priorities, such as infrastructure and education. As regards negotiations over Nagorno-Karabakh, direct bargaining has most often taken place between the government of Armenia (the patron state) and the government of Azerbaijan (the home state). It was not until 1993, five years after the outbreak of violence, that Azerbaijan, newly under the leadership of President Heidar Aliev, first recognized the Karabakhi government in Stepanakert as a party to the conflict. While most high-level talks have continued to take place between the Armenian and Azerbaijani presidents, the Armenian presidency has been held by a Karabakhi since 1998, rendering the distinction nearly moot. The current round of negotiations, known as the Prague process, is being conducted primarily between the foreign ministries of Armenia and Azerbaijan. The Prague process is a series of negotiations between the Armenian and Azerbaijani foreign ministries that began in 2004. The process is mediated by France, Russia, and the United States. Both sides have agreed that if a settlement is reached, five of the seven districts adjacent to Nagorno-Karabakh that are currently occupied by Armenian forces will be returned to Azerbaijani control and international peacekeepers will be deployed. International mediators would like to see Armenia and Azerbaijan shake hands on an interim status for Nagorno-Karabakh. This would create a temporary legal framework under which the territory could trade, receive foreign aid, and represent itself at the Organization for Security and Cooperation in Europe (OSCE) and other international bodies. Unfortunately, the effect of lowering the costs of nonrecognition for Nagorno-Karabakh would be to decrease the Karabakh Armenians' willingness to make concessions to avoid a continuation of the status quo. So an interim status agreement is not in Azerbaijan's interest unless it receives something in exchange. According to the International Crisis Group, agreements on the referendum must give Azerbaijan some form of security that the referendum will not necessarily result in secession but at the same time allow Armenians to believe it is possible to achieve independence for Karabakh. Status is deemed so difficult to resolve at the bargaining table that any resolution can only be achieved later. However, unless the ethnic Armenian distaste for Azerbaijani rule and Azerbaijani antipathy for Karabakhi independence are alleviated, the prospects for a resolution of the issue of status are not likely to improve with time. In 1989, ethnic Armenians made up an estimated 77 percent of the population of Nagorno-Karabakh. After the forced displacement of most Azeris, the 2001 population was estimated to be 95 percent Armenian. Political dominance of ethnic Armenians in the region is complete. If Karabakh rejoined Azerbaijan as an autonomous region, Azerbaijan could promise to preserve total local political dominance of the Karabakh Armenians, but the promise would not be credible. This is because the right of return for displaced Azeris is a demand not just of the government of Azerbaijan but of the international community. Given that large numbers of Armenians have emigrated from Karabakh as well, a return of even half the Azeris would dramatically alter the ethnic makeup of the region. The return of Azeri citizens means the return of Azeri voters; under any democratic arrangement, Karabakh Armenians would lose control, not just to national Azeri politicians but also to Azeri interests in local politics. In bargaining terms, the issue of status raises a problem of issue indivisibility. Either Nagorno-Karabakh is a part of Azerbaijan and Azerbaijani sovereignty extends to its territory, or it is independent. There is no half way. In order for one side to concede status at the bargaining table (or to accept rules for a referendum that allow the other side to win), it must be compensated by concessions on other issues. If the Karabakh Armenians were to concede the issue of status, side payments might, for example, include a favorable revenue-sharing agreement with the oil-producing regions of Azerbaijan, the promise of infrastructure and other state investment in Karabakh, strong Karabakhi representation in the central government, and robust local autonomy. But promises like these are unenforceable. Once the issue of status is conceded, the Azeri government would have no incentive to act on any of its promises. Infrastructure projects might never materialize, revenue sharing could be renegotiated, and autonomy and central government influence would vanish. Negotiators from Karabakh would be foolish to concede status in exchange for concessions on which Azerbaijan would likely later renege. For an example of a likely outcome, the Karabakh Armenians need look no farther than Adjaria, a region that enjoyed de facto independence from Georgia from 1991 to 2004. Once Georgia reestablished control of the territory, no meaningful autonomy was given to the region. Prior to reunification, secessionist control was total; after reunification all meaningful regional autonomy was eliminated. The same occurred after the unrecognized state of Gagauzia rejoined Moldova. Authority promised to the Gagauz in the settlement was gradually reclaimed by the central government. One possible solution to problems of credible commitment is the participation of a third-party guarantor. To be effective in this role, however, the third party must be both neutral and credible. According to Thomas de Waal, a journalist and Caucasus expert, Russia advocated aggressively for this role in the Nagorno-Karabakh conflict in the 1990s, but Azerbaijan resisted the presence of Russian troops in its territory because it did not view Russia as neutral. While a more neutral international force might now be available, it is hard to see how international peacekeepers would enforce the type of provisions that would be necessary to convince Nagorno-Karabakh to rejoin Azerbaijan. How would an international actor force the Azerbaijan government to invest sufficiently in Karabakh's development or respect the right of Karabakh Armenians to be educated in their own language? If side-payments from Azerbaijan to Nagorno-Karabakh prove difficult to enforce and the option of Nagorno-Karabakh conceding the issue of status is thus unworkable, perhaps an agreement in which Azerbaijan concedes the issue of status is more promising. The Goble plan, introduced in 1992, establishes a framework for such a deal. The plan requires Azerbaijan to surrender its claim to Karabakh and the Lachin corridor in exchange for Armenian withdrawal from all other occupied territories and the establishment of an internationally-monitored travel corridor between Azerbaijan and Nakhchivan. While the deal has the benefit of being enforceable, it has a number of problems. First, it requires that Armenia surrender territory in exchange for independence for Nagorno-Karabakh, an exchange many in Armenia do not support. Additionally, while Armenia is loath to compromise control over its border with Iran, it is not clear that easing travel between Azerbaijan and Nakhchivan is nearly as important to Azerbaijan as control of Nagorno-Karabakh. De Waal suggests that Heydar Aliev, then-president of Azerbaijan, also had trouble selling this compromise in Azerbaijan because the gap between his public rhetoric, which promised reconquest of Karabakh, and his private negotiating positions, in which he appeared prepared to concede the issue of status, was simply too great. Perhaps, however, if the proposed Armenian concessions were greater, the rhetoric gap would have mattered less. Azerbaijan has imposed economic sanctions on Nagorno-Karabakh and Armenia since the early stages of the conflict, both to limit Armenia's military capabilities and to raise the costs of non-settlement. The sanctions impose economic costs on Armenia, which therefore has incentives to make concessions at the bargaining table. The sanctions represent one of Azerbaijan's primary bargaining chips in current negotiations. Unfortunately, they have also had counter-effects that make a negotiated settlement more difficult to reach. First, while sanctions impose costs on Armenia overall, some groups actually benefit economically; the sanctions have generated profitable import monopolies for politically connected actors in Armenia, giving them an economic incentive to oppose settlement. In the 2008 presidential campaign, opposition candidate (and former president) Levon Ter-Petrossian, campaigned on allegations that his successor Robert Kocharian and his proposed successor, Serzh Sargasyan, run a "kleptocracy" that provides economic benefits to politically connected oligarchs. Many of these benefits derive from market distortions created by the sanctions and border closures associated with the conflict in Nagorno-Karabakh. Second, the cutting of economic ties between Armenia and Azerbaijan ended cooperative economic relationships between actors across the border. At the root of the conflict in Nagorno-Karabakh is the antipathy of ethnic Armenians for Azerbaijani rule and of ethnic Azeris for surrendering any territory to Armenian authority. Economic cooperation and the daily interactions of trade and business represent one of the clearest channels through which these subjective preferences can be changed. Sanctions and border closures all but eliminate this vehicle. The primary contribution of bargaining models to the study of unrecognized states is that they demonstrate that two rational, well-informed actors can fail to reach an agreement, even if an agreement exists that could make both sides better off. Because the issue of status is indivisible and most options for side payments would occur in the future, status agreements in Nagorno-Karabakh are unenforceable. The prospects for negotiated settlement hinge, then, on one side being willing to concede the issue of status almost unilaterally. This is unlikely unless the costs of non-settlement become much higher than they appear to be at present. The costs of economic isolation for Karabakh are large but are substantially muted by support from the large Armenian diaspora community. Many of those hurt most by non-settlement have left Karabakh and begun other lives outside the disputed territory. Non-settlement has hurt them, but settlement now would not help them. For Azerbaijan, the costs of military mobilization and lost investment are substantial, but public pressure to resolve the conflict peacefully is weak. Because the cost of non-settlement is relatively low, the Azerbaijani public seems unprepared to surrender its claim to Nagorno-Karabakh. The intractability of the central issue of status does not entirely preclude the possibility that a negotiated agreement might be reached that both mitigates the costs of the conflict and reduces the chance of renewed violence. Setting aside the issue of status as irresolvable in the near term is an important first step toward reaching such an agreement. In 2007, when the so-called Madrid principles were formally presented, the International Crisis Group recommended that if a comprehensive agreement could not be reached, the sides should "agree what can be agreed and clearly identify points still in dispute." The Madrid principles have not been accepted by the two sides, and the exact nature of the principles is not public, but negotiations would clearly benefit from focusing on an agreement that is expressly agnostic about status itself and any of the future methods that will be used to determine status. Armenia currently occupies around 13 percent of Azerbaijan's territory while Azerbaijan-lead economic sanctions impose high costs on Armenia. An agreement in which Armenia withdraws from some of the occupied territory in exchange for an easing of economic sanctions would be in the interests of both sides. Likewise, while the withdrawal of Armenian forces would induce a commitment problem (Azerbaijan would have incentives to reinstate sanctions after the withdrawal is completed), it might be easier to find a third-party enforcer for this more modest agreement; there would be less to enforce. Domestic interests within Azerbaijan and Turkey would also benefit from the opening of trade with Armenia, helping to generate domestic political incentives for Azerbaijan to maintain economic relations once established. In 1992, the Organization for Security and Cooperation in Europe created the Minsk Group to encourage a peaceful, negotiated resolution to the conflict between Azerbaijan and Armenia over Nagorno-Karabakh. The group consists of a co-chairmanship (France, Russia, and the United States) along with Belarus, Germany, Italy, Portugal, the Netherlands, Sweden, Finland, Turkey, Armenia, and Azerbaijan. The most productive step that could be taken by the members of the Minsk Group would be to offer the means to enforce any agreement that is reached. The Moscow declaration, signed by Armenia and Azerbaijan in November 2008, states that any agreement must include "legally binding international guarantees." No such guarantees will be binding if one or more of the Minsk Group does not commit itself to enforcing them. Beyond the distraction of the status issue, the largest impediment to an agreement is its enforceability. Such an agreement, if enforced, would not only reduce costs to both sides in the near term, it would reduce the risk of war and could pave the way toward eventual resolution of the issue of status. Besides imposing economic costs on both sides, the closing of the border between Armenia and Azerbaijan has reduced interaction between Armenians and Azeri citizens, preventing human contact from mitigating the hostility between the two populations. The normalization of economic ties across the border could go a long way toward reducing animosity over time and eventually making a compromise on the issue of status more palatable to the public on both sides. Similarly, a withdrawal of Armenian troops from much of the currently occupied territory would reduce the willingness of the Azerbaijani public to support a return to war. Any potential agreement between an unrecognized state and a home state that requires either side to concede the status of the disputed territory is unlikely to succeed. Neither the states themselves nor the international community have the incentives and capabilities to enforce the side payments necessary to induce one side to voluntarily make such a concession. Efforts at a negotiated settlement must therefore be more modest, focusing on the parties' mutual interest in mitigating the costs of unresolved conflict and reducing the risk of renewed violence. In the case of Nagorno-Karabakh, Armenian withdrawal from Azerbaijani territory, coupled with the easing of economic sanctions by Azerbaijan, would significantly reduce costs to both sides in the near term. It would also encourage an opening of trade and normalization of economic relations—a promising means to produce the eventual softening of positions necessary for resolution of the issue of status. Benjamin A.T. Graham, a Ph.D. candidate in political science at University of California San Diego, was recently in residence at the Georgian Foundation for Strategic and International Studies and the Peace Research Institute of Oslo. A previous version of this paper was presented at the conference After Kosovo: Whither Karabakh? at the University of Michigan. Vicken Cheterian, War and Peace in the Caucasus (New York: Columbia University Press, 2008), pp. 97-142. "Nagorno-Karabakh: Viewing the Conflict from the Ground," International Crisis Group (ICG), Europe Report, no. 166, Sept. 14, 2005; Thomas de Waal, Black Garden: Armenia and Azerbaijan through Peace and War (New York: New York University Press, 2003), pp. 285-6. De Waal, Black Garden , pp. 285-6. Christoph Zurcher, The Post-Soviet Wars (New York: New York University Press, 2007), pp. 157-69. "Nagorno-Karabakh: Risking War," International Crisis Group, Europe Report, no. 187, Nov. 14, 2007, p. 4. "Armenia: Country Profile," The Economist Intelligence Unit, Jan. 2007. "Nagorno-Karabakh: Risking War," ICG, p. 11. Eurasia Insight (New York), July 26, 2003. Lev Frainkman, Evgeny Polyakov, and Carolina Revenco, "Costs of Closed Borders for Armenia's Trade," Economic Policy and Poverty, no. 8, pp. 6-9. "Nagorno-Karabakh: Viewing the Conflict from the Ground," ICG, pp. 12-3. Ibid., pp. 4-5; de Waal, Black Garden, p. 285. "Nagorno-Karabakh: Risking War," ICG, pp. 12-4. De Waal, Black Garden , p. 226. "Nagorno-Karabakh: Risking War," ICG, pp. 2-4. David Laitin and Ronald Grigor Suny, "Armenia and Azerbaijan: Thinking a Way Out," Middle East Policy, Oct. 1999, pp. 145-76. "Nagorno-Karabakh: Viewing the Conflict from the Ground," ICG, p. 4. De Waal, Black Garden , pp. 284-9. Kimberly Marten, "Dislodging Warlords: Cases from Post-Soviet Georgia," Proceedings of the International Studies Association, Feb. 2009, pp. 21-6. Ibid., p. 2; Valerie Bunce, "Minority Politics in Ethnofederal States: Cooperation, Autonomy, or Secession?" working paper, June 14, 2006, pp. 10-11. Steven D. Roper, "Regionalism in Moldova: The Case of Transnistria and Gagauzia," Regional and Federal Studies, Autumn 2001, p. 118. Barbara F. Walter, "The Critical Barrier to Civil War Settlement," International Organization, 51 (1997): 335-64. De Waal, Black Garden, pp. 253-6. Paul A. Goble, "How the 'Goble Plan' Was Born," Radio Free Europe/Radio Liberty, Caucasus Report, June 8, 2000. De Waal, Black Garden , p. 265. Dov Lynch, Engaging Eurasia's Separatist States (Washington: United States Institute of Peace Press, 2004), pp. 63-4, 82. Radio Free Europe/Radio Liberty, Mar. 5, 2008. "Armenia: Picking up the Pieces," International Crisis Group, Europe Briefing, no. 48, Apr. 8, 2008, p. 10. Benjamin A.T. Graham, "Unrecognized States: A Bargaining Model Analysis," Social Science Research Network working paper, 2009. "Nagorno-Karabakh: Risking War," ICG, p. ii. Radio Free Europe/Radio Liberty, Nov. 3, 2008. Related Topics: Central Asia | Fall 2009 MEQ receive the latest by email: subscribe to the free mef mailing list This text may be reposted or forwarded so long as it is presented as an integral whole with complete and accurate information provided about its author, date, place of publication, and original URL.